Description	 Supposed to look like coral; could've added more fanciness to each, but thought I'd keep it simple. Will the colors correspond to ego types, or will they be randomized as far as that goes? Changing the colors for particular egos wouldn't be hard, I chose eight arbitrary colors. These are cool, but my imagination ran to slightly crunchier-looking ring edges. Like a naturally grown piece of coral, unrefined. For color, my mind ran to colors of actual coral, with brighter colors. Coral the "official" color/colour is a reddish/pinkish hue. Purples, yellows, blue-green, etc. Also white (dead coral) is an option. I installed one for now, let's see what others say about others. If you had to pick one, I hope you picked the red or blue one. I agree with XuaXua about the ring looking more natural. It's also supposed to be a wedding ring, whereas right now it looks a bit spiky/pointy for that. Though, I do think these are great tiles in their own right! I'm imagining them used for some ring grown as a single gemstone. * multiple tiles would require special selection code. This is doable but has little point if the tile is supposed to change anyway. * every tile committed to git bloats the archive even if subsequently removed. Eronarn: do you mean something akin to http://www.trendir.com/dining-entertaining/l%27objet-gold-plated-rope-enamel-coral-napkin.jpg [^] but more ring shaped? While the red of that coral is... coral, I don't think he meant a sprig of coral stuck in a gold wristband (though that is kinda neat). 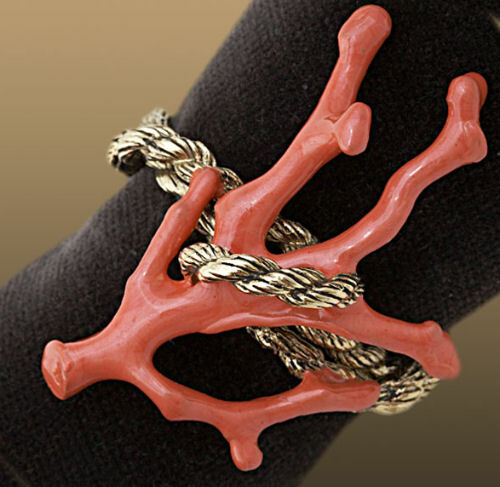 In my mind, and I know I'm not the creator, I thought a piece of tubular coral (holes and all - a "Branch Coral") would have been shaped into a rough ring. (4) a tubular one based on a Branch Coral (google it). Obviously, I meant the coral part, not a wristband. Something like that except with branches not longer than their thickness (ie, stumps), and circular rather than a misshapen ellipse. Well, if you look at the image URL you reference, while it is a branch coral tied into a wristband, that could also be a very small ring with a cool branch attached to it. As a ring concept, that image is simultaneously completely inaccurate and totally on the mark. If you need a gemstone, a pearl is an obvious choice. I was referring to only one of a variation of 8 different styles for the rings; rather than a standard shape, since there are 8 rings generated each game, it would be pretty cool to have 8 unique artefact images just for the coral rings. I think having dramatically different colors, as in the proposed tiles, doesn't work as well for a group of similar items intended to be worn at the same time. What about having each with a pearl as the gemstone, and varying the color? Or, perhaps each gem could be cut into a different undersea shape? Seahorse, clamshell, turtle, etc. I'm not clear on how many rings we're really shooting for, so this time I only upped the one. If we want color variation on this style of ring, that's no problem.